The vertical village concept offers a vibrant alternative to drab and dreary residential tower blocks. With rapid urbanisation continuing the need for space-efficient towers in many cities, is it time to embrace this new trend as the future of high-rise living? The Vertical Village exhibition in Hamburg allows visitors to experiment with an interactive sculpture. Image courtesy of MVRDV. The Beirut Terraces project is scheduled for completion in 2015. Image courtesy of Beirut Terraces. The project's overhanging terraces provide shade, greenery and outside space throughout the tower. Image courtesy of Herzog & De Meuron. The Beirut Terraces have been designed to offer appealing exteriors and a sense of space throughout the building. Image courtesy of Beirut Terraces. As increasing numbers of people around the world migrate from the countryside to fill swollen urban centres, the character of many cities is changing, and arguably not for the better. This mass movement, which is particularly noticeable today in the rapidly urbanising countries of East Asia and the Middle East but has been a factor almost everywhere, creates an urgent need for space-efficient and affordable housing. The response of governments and urban planners to this challenge, whether in modern-day China or the UK through the 1960s and 1970s, has thus far been depressingly similar: immense concrete tower blocks that satisfy the basic requirements of density and affordability, but offer precious little else. These high-rise structures overrun traditional low-rise urban neighbourhoods, as well as tending to squat unattractively over a city’s skyline. But with urban populations showing no sign of slowing their growth, architects are challenging the received wisdom on high-rise living. The relatively small footprints of apartment blocks might make them essential to providing the requisite number of homes in densely-packed cities, but does their necessity mean that all other aesthetic and standard-of-living considerations have to go out the window? "Architects are challenging the received wisdom on high-rise living." Dutch architecture firm MVRDV has been a major proponent for the rethinking of tower blocks in the last few years. The company has conducted extensive research into the ‘vertical village’ concept, specifically to address rapid urban growth in large East Asian cities such as Taipei, Seoul, Beijing and Tokyo. Although the term remains somewhat nebulous, the vertical village is intended to represent a mode of high-rise living that maintains the space-saving benefits of traditional tower blocks without the aesthetic and societal baggage that comes along with them. The idea is that smart, people-centric design can help give high-rise blocks the same sense of community, personality and tradition as their low-rise counterparts. MVRDV concisely captures the challenge in a statement accompanying the Vertical Village Exhibition, a partnership between MVRDV, the Why Factory and Taiwan’s JUT Foundation for Arts and Architecture to showcase the concept of the vertical village for East Asia. The exhibition, which makes the case for the concept for urban regeneration projects and allows the public to experiment with an interactive, modular vertical village sculpture, has previously visited Taipei and Seoul, and has now taken residence in Hamburg with redesigned proposals for European city planning. "Huge apartment blocks and anonymous high-rise settlements are the characteristic features of surging growth in Asian cities," the statement reads. "Is there any alternative to this? Can a new model for development in big cities be imagined? Can we infill these neighbourhoods and still retain the qualities of a traditional village? Is it possible to develop a ‘vertical village’ to create a three-dimensional community that will bring diversity, flexibility and communication back into local neighbourhoods?" MVRDV’s concept will appeal to anyone who has been struck by the oppressive mass of modern tower blocks, but what does the vertical village actually look like, and will it become a reality? "Can we infill these neighbourhoods and still retain the qualities of a traditional village?" Attempts to harness the vertical village concept are in various stages of development around the world. In the Lebanese capital of Beirut, the Beirut Terraces project is currently under construction, setting a useful template for alternative high-rise development. 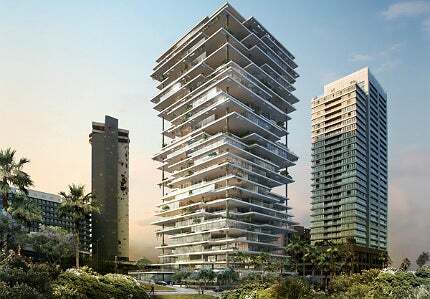 Due for completion in 2015 according to the building’s Swiss design team Herzog & De Meuron, the 120m high-rise tower is structured around parallel, overhanging terraces with multiple modular apartments set on each platform. The design is intended to subvert traditional high-rise issues in a number of ways. While living spaces are set slightly back towards the shady core of the building, the generously proportioned surrounding platforms create communal outside space on every storey. Extensive use of greenery serves to blur the boundary between interior and exterior space, while also protecting residents’ privacy and modulating the Lebanese climate with shade and healthy microclimate creation. The Beirut Terraces’ attempt to reconcile a tower block with traditional and modern living standards marks it as a perfect example of the vertical village trend, and if it is completed on schedule and to plan, it will likely be held up as a standard to follow in years to come. "Greenery serves to blur the boundary between interior and exterior space." Other designs are also emerging to push forward the vertical village trend. In late 2011, a team of OFF Architecture, PR Architect and Samuel Nageotte won the Solar Park South International prize with an eye-catching vertical village concept designed to create residential and recreational spaces that cling to the columns of the viaduct carrying the Salerno – Reggio Calabria highway in Italy. In China, meanwhile, Tokamarch Architects’ XishuangbanNa Residence design is following in the Beirut Terraces’ footsteps with a sloping layered concept that also uses plants – bamboo and local woods, in this case – to provide privacy, a pleasant microclimate and a nod to traditional village building methods. The building’s communal spaces and stairways are designed to encourage communication between residents. Beirut Terraces and the new wave of vertical village designs serve to demonstrate how outdated the one-size-fits-all model of residential tower construction has become. China and other countries dealing with rapidly urbanising populations have an opportunity to lead the charge towards the future of high-rise living; if they embrace that challenge, the days of the grim, grey tower block could be numbered. The appetite for tall skyscrapers is especially significant in China, which currently houses four of the world’s tallest buildings. Inquests into deadly fires occurring in high-rise towers in both London and Dubai have revealed severe failings by both landlords and authorities in keeping residents safe.